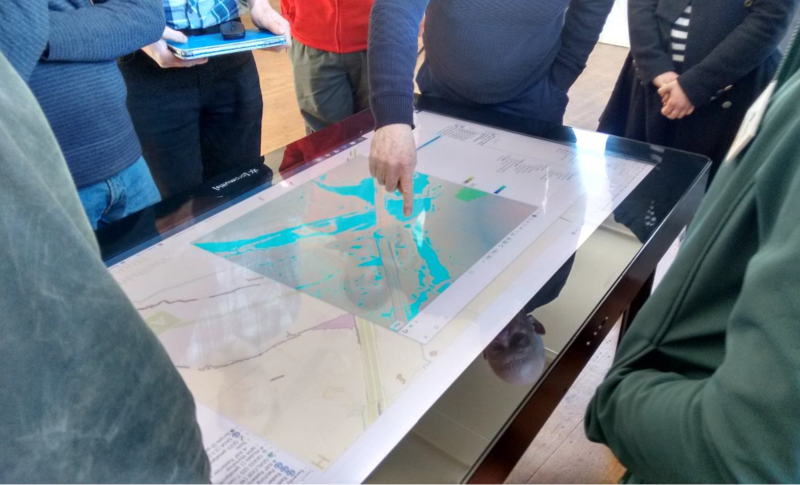 With our Augmented Reality (AR) Sandbox we have been able to support communication and engage with a wide range of stakeholders to explore flood risk and natural flood management (NFM) concepts . The sandbox is an effective way to start conversations about catchment management using an interactive digitally-enhanced physical model. We have also been supporting the Ensemble research programme with a common aim of working together for digitally-inspired environmental science to help people manage risks and build resilience. Now, working with the Ensemble team, the Q-NFM research project at Lancaster University and Natural England, we have helped take a step further by pairing the sandbox with an interactive digital table, which allows conversations started at the sandbox to focus on a specific place. With the iCaptureFlood table, detailed local information can be displayed digitally. Furthermore, the views and knowledge of people who know most about a place can be captured digitally, and fed into improved models of flood risk almost immediately. This is why we call the iCaptureFlood table “getting your data and knowledge into models you can see”. 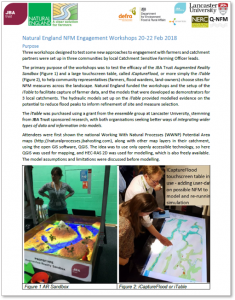 Earlier this year the iCaptureFlood table was trialled in three NFM engagement workshops in Somerset, Huntingdonshire and Cumbria. Natural England funded the workshops and the setup of the iTable to facilitate capture of data from farmers as part of the Catchment Sensitive Farming (CSF) initiative. Our report says more about the technology, and how it is being applied to help bring people, data and computer models closer together. The iTable was part funded by a grant from the Ensemble project.